General Manager Drake Maverick recaps the Fatal 4-Way title match from Sunday’s Kickoff show. Tonight, Kalisto will face Mike Kanellis in the opener, and then the main event is Akira Tozawa v Hideo Itami. Kalisto (w/ Gran Metalik & Lince Dorado) defeats Mike Kanellis (w/ Maria Kanellis). Maria joins the commentators and it sounds like she’s putting on some weird voice. Maybe she’s sick? Kalisto and Kanellis go back and forth Maria and English argue on commentary and the other two commentators can barely get in a word in edgewise. Finally, they remember a match is going on and some focus is put on the action in the ring. It doesn’t last long, and the bickering comes back and makes it hard to focus on the match. Kalisto and Kanellis can’t hear the stupid commentary though, so they’re having a solid big guy v little guy match. Kanellis appears to be in control, but then he slips on a banana peel and Kalisto rolls him up for the pin. Fine match, but hard to rate because the commentary was so grating and distracting. I have no idea what they thought they were accomplishing with that, of even what purpose this match served in the first place. Joseph and McGuinness hype the Worlds Collide tournament this Saturday on the WWE Network. Backstage, Drew Gulak and Gentleman Jack Gallagher appeal to Humberto Carrillo, telling him that he should do less high-flying and more wrestling. 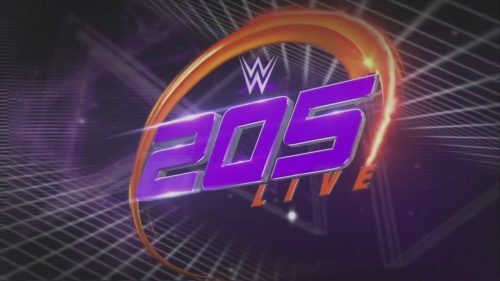 They offer their services to make a better 205 Live. Elsewhere, Ariya Daivari and Hideo Itami are talking about how Buddy Murphy got lucky in the multi-man match at the Royal Rumble Kickoff. Daivari and Itami promise victory for Itami tonight in one-on-one action. Earlier in the parking lot, Tony Nese attacked Noam Dar and had to be pulled off by a gaggle of officials and wrestlers. Kayla Braxton reports that Dar is not seriously injured, but that Nese has been indefinitely suspended. Braxton then gets a word with Buddy Murphy, who brags about his win last night and wonders who his next challenger will be. Akira Tozawa (w/ The Brian Kendrick) defeats Hideo Itami (w/ Ariya Daivari). Tozawa controls the early going, as English explains that he has something to prove in defeating a legend like Itami. He tries the back senton from the top rope but Itami gets up, and then when Tozawa tries the senton from the second rope Itami gets his knees up. That gives Itami control. Itami focuses on the neck, keeping Tozawa grounded and softening him up for his finisher. Tozawa makes various comeback attempts but Itami is ready for each of them, and he quickly squashes them. Late in the match, Itami accidentally takes out Daivari with a dropkick to the face. Tozawa hits Itami with a release German Suplex, and then lands the top-rope senton to get the pin. Good showing for Tozawa, and this was about on par with Itami’s entire WWE run. It was pretty good, but never really approached great. After the match, Daivari helps Itami back to his feet but then slams him right back down. Itami and Tozawa had a good main event, and it’ll be interesting to see if the aftermath leads to anything for Daivari. The Kalisto v Kanellis match was absolutely nothing, but they did further the Nese/Dar issue, and set up Gulak & Gallagher v Carrillo, so the train just keeps on rolling.